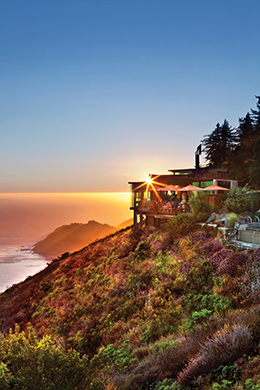 The Post Ranch Inn in Big Sur is an astonishing place, as beautiful as a small resort hotel can get with unparalleled style and personalized, peerless service to match. 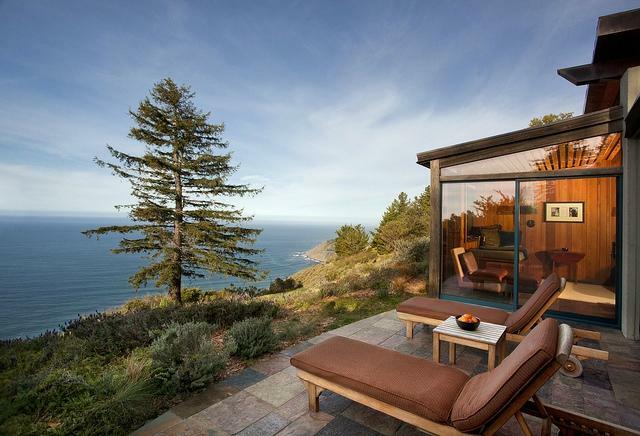 Dramatically perched on a cliff overlooking the Pacific Ocean, this is a getaway to rival the world’s best: rustic-chic rooms, suites and tree-houses feature private decks with mountain or ocean views, and wood-burning fireplaces. Rooms also include fully stocked free mini-bars (we loved the freshly-made hummus and exotic cheeses) and WiFi, plus iPod docking stations. Some have indoor and outdoor spa pools. Mercifully, the rooms do not have televisions (nor alarm clocks) but the smashing views of the mountains and sea more than make up for this. Post Ranch Inn is a serene, Zen-like destination, perfect for relaxation. The carefully groomed grounds are filled with not only fragrant, flowering plants and trees, but fine pieces of sculpture that blend seamlessly with the natural foliage. A full daily gourmet breakfast is included in the rate, and it is quite a stunning display of smoked salmon, breads, omelettes to order, meats, cheeses, fruits, cereals and fresh juices. There are complimentary loaner Lexus cars, as well as complimentary yoga, guided nature hikes, garden tours, meditation and star-gazing classes. Other amenities include a spa, two cliff-top infinity pools, a swimming pool and a fitness center. The many therapies on the menu can be taken in your room or in the scenic spa. An ocean-facing restaurant is also offered. 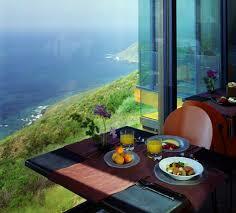 Sierra Mar, awarded Wine Spectator’s prestigious Grand Award, is fine dining to be sure…and more. Chef John Cox creates innovative cuisine featuring ingredients inspired by a sense of place and culture. Wines come from an award-winning cellar. While there are many beautiful places in the world, only a handful can compare with Post Ranch Inn. 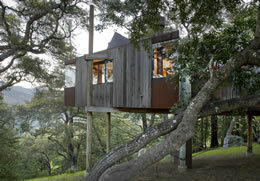 This is more than simply the ultimate Big Sur experience. It is a world class experience, a celebration of life, nature, beauty and good living. Never stuffy or pretentious and best called casually elegant. There are obviously caring, thoughtful owners and management involved. No pets are allowed and the minimum age for guests is a civilized 18. 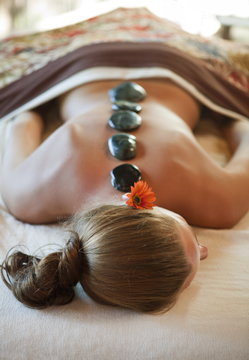 Check out the many packages to indulge your body, mind and soul at http://www.postranchinn.com.